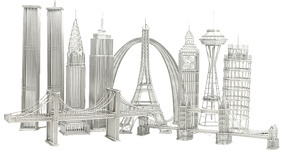 Our Executive Architecture Collection of steel wire replicas combines the captivating architecture of each landmark with the simplicity of steel wire to create stunning replicas of world icons from the United States, Europe and Asia. Each wire model is constructed of solid soldiered steel wire to create the most authentic architectural replica. Consider using these models for centerpieces, corporate awards or add to your home or office decor. Who do you know that would love an authentic replica of their favorite world landmark?